To own a state of the art exclusive luxury home is an aspiration we all hold on to. If asked to describe a dream home, what features would you look out for? Would you like to own it in within the city or own a weekend getaway home? A recent study shows there is an uptick in owning luxury retreat homes away from the city. Introducing Earthitects “Stone Lodges” (SERVICED PRIVATE RESIDENCES). Earthitects the design house of Orange County Resorts, in partnership with Orange County’s renowned hospitality and maintenance services bring to you its natural setting, a luxurious rendering. Stone Lodges are the next in cutting edge technology lodges. Timeless in its design and flawless in its crafting! To add to its charm and exclusivity there are just 15 of these private 3BHK Villas planned. Spread across 13 acres of lush green environment these 3 BHK villas are about 6200sq ft.
Stone Lodges located at Kalpetta, Wayanad is a panoramic town spread across lush evergreen tropical forests of the Western Ghats of Kerala. Wayanad means ‘The Land of Paddy Fields. It is a combination of two words “Vayal“(paddy field) and “Naad“(land). Did you know that Wayanad is a part of the UNESCO World Network of Biosphere Reserves? More reason to own this one of a kind luxury property! That also makes it an ideal weekend getaway with a distinguished identity. Waynard boasts of an ideal weather throughout. For a nature lover the natural beauty and pristine atmosphere adds to the charm. Built on sloping land, each individual lodge intertwines with the mountain into three distinct levels that embrace the wilderness at an aesthetic level and invite it indoors to be an essential part of its soul. And, without such plebeian contrivances as compound walls, you can rest assured that nothing will ever get between you and your daily dose of inspiration. On the Lap of Infinity The woods are lovely, dark and deep. And they now afford the chance of a languorous peep. The Exterior Deck of your private infinity pool underlines the design vernacular: a seamless view of the forest as you daydream on your daybed in the gazebo, lulled by birdsong and the fragrance of your dinner cooking on the poolside BBQ. Life is for the Living When you choose to live in the bosom of the forest, it makes no sense to hide yourself away. The inclusive design of your large Living Room creates a substantial, yet intimate space which bespeaks rustic chic in every inch, and allows you to savour the essence of the woods without stepping out. The Masterful Bedroom Your Master Bedroom understands one thing: that you are the master of all you survey. And, it gives you enough to survey, and lord over. A private retreat within the larger sanctuary, this opulent ode to rest & relaxation boasts a wide open living space, a viewing deck with a stunning view and an en-suite bathroom with a tranquil outdoor shower. All adding up to a convincing argument against having another ‘living’ room in the house! About George Ramapuram – He is the brain child behind The Stone Lodges. 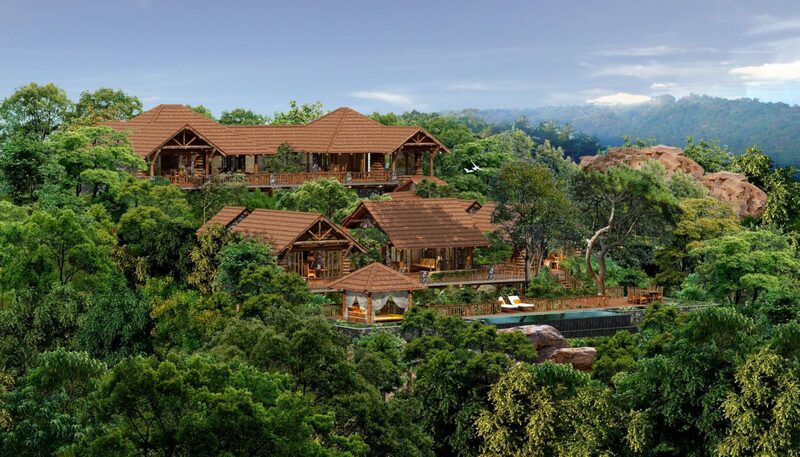 He first conceptualized and built the iconic Orange County Resort, Coorg. Followed by the globally feted resort at Kabini. The latest entrant is the resort in Hampi, which promises to be an iconic landmark. Mr Ramapuram’s vision is of a dwelling that celebrates the joy of living amidst nature. The Stone Lodges promises to be world-class architectural living environment. What will make it special is how it will seek to merge the walls between the mountain and the manor. And therein lies the beauty of a home that will, grow out of the soil, around the slopes, and along the forest! About Earthitects – Architects with a difference! Earthitects, are dedicated to the spirit of the land, and every dwelling built blends seamlessly into its natural habitat, and emanate from the very earth that binds us all. From the tenants of the House of Ramapuram that cherish ‘Excellence Rooted in Values’, the guidance has helped build some of the world’s most acclaimed resorts. Giving a whole new meaning to rustic chic. 21, Museum Road, Bangalore – 560025, Karnataka, India.